We believe that you shouldn’t feel that you can’t pursue your ambition to be a doctor or a dentist because of your family or school circumstances. 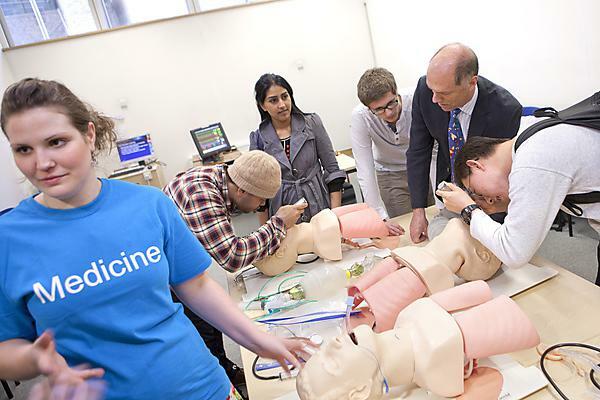 The Faculty of Medicine and Dentistry's widening access to medical and dental school workshops are student-led hands-on interactive sessions aimed to inspire, inform and support students in applying to medical or dental schools. We also encourage potential students from non-traditional backgrounds to apply, debunking some of the myths surrounding medical and dental schools, such as 'only private/grammar school students are accepted'. We don’t want any student to feel that they cannot pursue their ambition to be a future healthcare professional because of their family or school circumstances. In addition, we support almost all of the Faculty's widening participation events and Open Days, including facilitating the Teddy Bear Hospital workshops. We also attend career fairs and assemblies held at local schools and colleges. We also run mock interview sessions and give tips and advice on personal statements upon request. Our volunteers are passionate about teaching and helping a wide range of students pursue a healthcare professional degree. Sometimes a visit from us will start school students thinking about university education when they haven’t before. Volunteering for WAMS or WADS looks great on our students CVs, but it’s also a lot of fun to teach school students, and sometimes even their teachers. “Sometimes a visit from us will start school students thinking about university education when they haven’t before. We consider it a job well done…it’s also a lot of fun to teach school students, and sometimes even their teachers. We hope it means that the Faculty never miss out on students with the potential to become amazing doctors [or dentists].” ‑ Abigail Carey, WAMS President.